Colorado Springs, at an elevation of 6,035 ft., is a city in Colorado at the eastern foot of the Rocky Mountains. It lies near glacier-carved Pikes Peak, a landmark in Pike National Forest with hiking trails and a cog railway leading to its 14,114-ft. summit. The city's Garden of the Gods park features iconic red-sandstone formations and mountain views. This is also the host of the annual Pikes Peak Ultra. 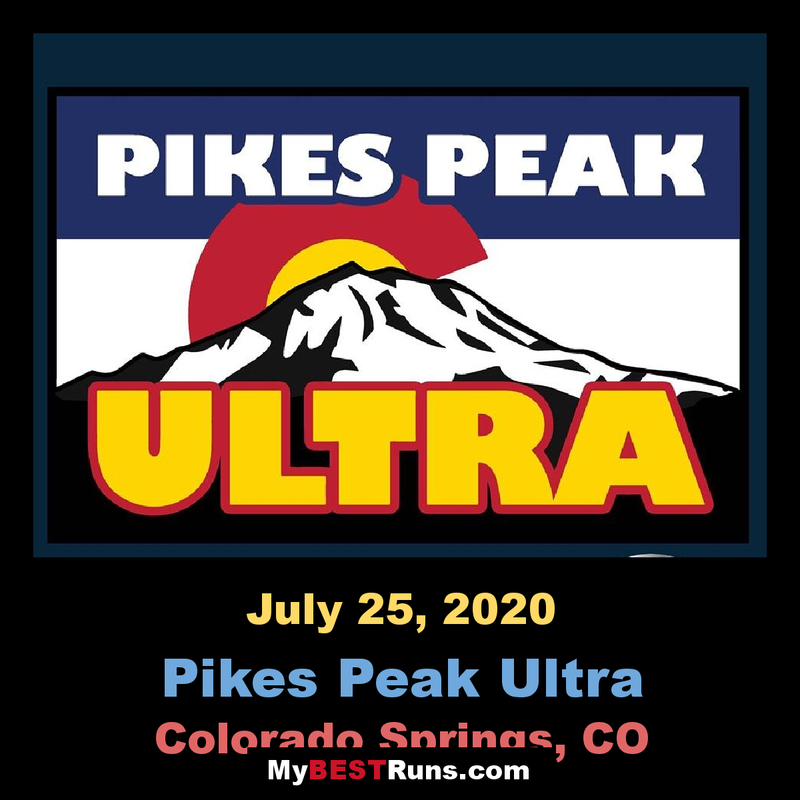 Pikes Peak Ultra was an event created to showcase some of the very best trails in Colorado Springs. It's course will take you from Bear Creek Regional Park, up High Drive, and into Cheyenne Canon. 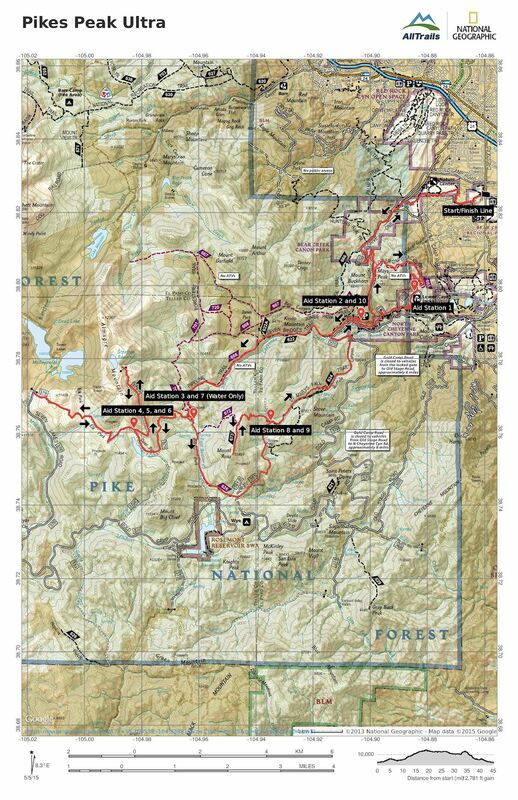 Runners will see Lower CaptainJacks, Seven Bridges, St. Mary's Falls, Helen Hunt Falls, Mt. Rosa, Almagre, Deer Park, and Elk Park. This is the first 50 mile event, open to the public, in Colorado Springs. 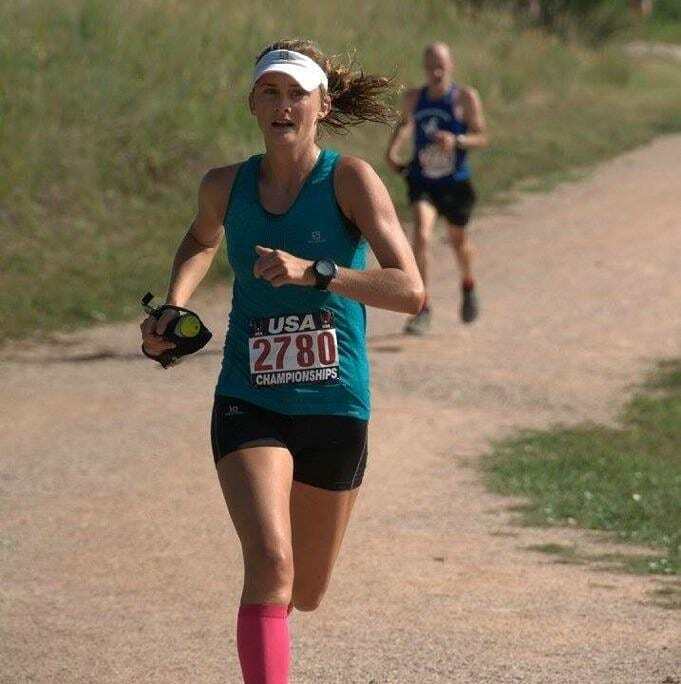 You'll begin at the parking lot near the dirt trail and will run through the park,on singletrack trails for 2.5 miles until your reach Bear Creek Road. Turn left onto the paved road and stay left for half a mile until you reach High Drive. Continue up High Drive, a dirt road, for 2 miles until you reach the gate at the top. While on High Drive, stay out of the water in Bear Creek. Bear Creek has the last known native greenback trout in Colorado. Once you reach the top of High Drive, turn left onto Lower Capt Jack or 665, and continue down on the singletrack for 2.5 miles to the aid station. Cross the road, dont go through the tunnel, and turn left onto Spring Creek Trail for one mile. At the fork, turn right onto the Columbine trail for 2.5 miles. The trail will then intersect with a paved road. Turn right and run up the paved road for less than a half mile to the parking lot. Veer left into the aid station and then continue down the dirt road, Old Stage Rd, for a mile. Turn right onto Seven Bridges and follow the trail for four miles until your reach the next aid station. There will be a few trails veering to the right but stay left until you reach the water only aid station. During this section, please stay out of the water as much as possible because this area has protected native greenback trout. They arent the same species as in Bear Creek but they are still protected. Once at the water only aid station, turn right and follow the 4x4 road for 2.7 miles until you reach the next aid station. From here you'll be running two out and back sections that will be returning to the aid station. You can have a drop bag at this aid station and will have access to it three times. For the first out and back, run to the gate near the top of Almagre and back for a total of 3.7 miles. This is the high point of the course at over 11,800ft. Enjoy the views of Colorado Springs and the front range at the top. You'll need to punch your bib at the turn around point. This will prove you ran the specified course. For the next section, run towards Elk Park to the turnaround point at Seven Lake Road. Make sure you enjoy the south side views of Pikes Peak. This section is a little longer, 6.4 miles, so be prepared. Even though this is a 4x4 road, its very technical and all above 11,000ft. You'll need to punch your bib at the turn around point. This will prove you ran the specified course. Once back to the Deer Park aid station, head back 2.7 miles to the water only aid station. From the aid station, stay left and continue down the road for less than a mile until you reach the singletrack trail on the left. Turn left and follow the singletrack for a mile until you reach the 4x4 road. Turn left onto the 4x4 road for 1.5 miles until you reach the next aid station. From the aid station, you'll run out and back to the top of Mt Rosa. The views from the top of Rosa are incredible! The video below shows the view from the top of Mt Rosa. Again, you'll need to punch your bib at the turn around point. Don't forget! This will prove you ran the specified course. Turn left and follow the singletrack 3.6 miles back to the aid station. After reaching the aid station, for a second time, continue down St Marys Falls for three miles until you reach Old Stage Road. Follow the road for 2 miles until you reach the last aid station. Dont turn back up Seven Bridges! Once you have reached the last aid station, turn left onto High Drive for one mile back to the gate. From the gate follow High Drive back to Bear Creek Road and through the park to the finish line.